KROHNE has opened its newest manufacturing facility and North America headquarters in Beverly, Massachusetts, USA. The new facility was celebrated with a formal inauguration event, tours of the manufacturing facility, and presentations from executives at KROHNE. Michael Rademacher-Dubbick, managing director KROHNE Group, opened the facilities in a ribbon cutting ceremony. The new facility is managed and operated by KROHNE, Inc., the KROHNE group’s subsidiary responsible for the North American region since 1979. The operations expansion represents the company’s long-term commitment to manufacturing in the United States. The new headquarters facility will produce a variety of new and existing flow and level products, while continuing to serve as the main distribution hub to North American markets for all other products. Administration, sales, service and marketing, and a new training center will also be located in Beverly. The new production building will be interconnected to a new state of the art, two story office building, tripling the floor space compared to the existing facility in Peabody, MA. Production and distribution operations will also be transferred to the new space. 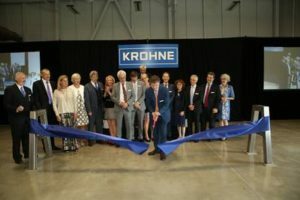 To celebrate the opening of the new facility, KROHNE held a formal ribbon cutting ceremony with local dignitaries and corporate ownership followed by a tour of the manufacturing facility and offices. The morning of the event was concluded with a series of short presentations, including a future-focused outline of KROHNE’s vision for its served industrial markets with key insights into technological developments for measurement instrumentation applications.